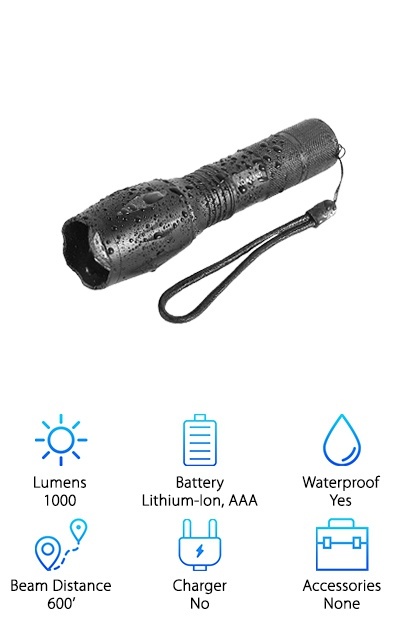 Whether you need a flashlight for hunting, camping, or just taking the dog for a walk at night, you should consider finding one that’s really durable and made to last. To help you find the best tactical flashlight available, we researched some of the top brands and best-selling products to put together our top 10 picks. Before we get started, let’s take a closer look at some of the features you need to know about before shopping. Lumens: Lumens are a measure of how bright the light of a flashlight is. For some reference, a reading light has about 20 lumens. The products in our tactical flashlight reviews have anywhere from 300 to 1600 lumens. Battery: Most of the high-quality lights we found can be powered by either a standard AAA or AA battery or a rechargeable Lithium-Ion. There are even a few products on our list that include the appropriate Lithium-Ion and charger. Waterproof: We have to mention that there’s a difference between waterproof and water resistant. a lot of these aren’t waterproof but most are water resistant. They can handle getting some rain on them. We noted this in the reviews. Beam Distance: Beam distance is the maximum distance the spotlight shines in ideal condition. Most of our picks have a beam distance of about 600 feet but you will find some that shine 1000 feet or more. Charger: A flashlight that comes with a charger means you don’t have to buy one separately. A few of our top picks do include chargers and rechargeable batteries so if you’re looking for a packaged deal, no worries! Accessories: Most of the products in our reviews don’t come with any accessories at all but if you want something a little extra special, there are a few extras available. You’ll find some that come with cases and even holsters. Now that you know a little more about these features, let’s move into our best tactical flashlight review. Here’s how it’s set up. Our top pick and budget pick are first. Running short on time? Those 2 products are a great place to start. After that, you’ll find the rest of the products that round out our best list. Don’t just look for ones from the best tactical backpack brands. There are plenty to choose from. Okay, let’s get to it! This is a pretty intense pick which is why it’s our best rated tactical flashlight. 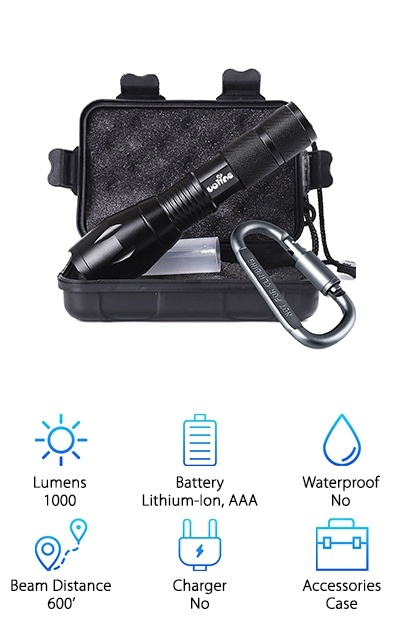 First of all, this is a full kit that includes a super bright tactical flashlight, a rechargeable Lithium-Ion battery, a battery charger, a case, and a manual. It’s made to last a long time. While it’s not waterproof, it is water resistant. That’s not all, it’s also anti-abrasive, skid-proof, and designed to be compact enough to easily slip into your pocket. Get this. It comes with 5 different modes: low, medium, high, strobe, and SOS. You can also adjust the beam so it acts as a focused beam of light or a floodlight to brighten a wider area. Want to know the best part? It comes with a 100% satisfaction guarantee. If you’re looking for the best tactical flashlight for the money, our pick is the J5 Tactical V1-PRO 300 Flashlight. 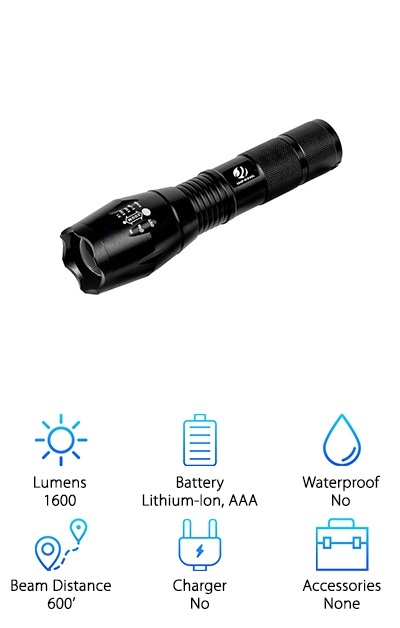 This basic flashlight is pretty impressive. With its bright 300 lumens, it lights up the night just as effectively as other more expensive models. The body is made from strong and lightweight aluminum alloy. What does that mean for you? It’s compact but tough enough to handle intense situations. There are 3 different lighting modes: high, low, and strobe for emergencies or to use for visibility if you’re out cycling at night. Not only that, but it will run on a single AA battery for hours. You can change the focus of the beam from an intense spotlight to a floodlight for wider illumination. This best cheap tactical flashlight packs a big punch. The Outlite A100 is one of the best small tactical flashlights we came across. At its most extended, it’s just about 6 inches long. Despite its size, it really lights up the night. In spotlight mode, the beam travels about 600 feet. There’s a flood feature, too. It’s water resistant so you can use in rainy weather without worrying about damage. There’s some versatility when it comes to power, too, since you can use either an 18650 Lithium-ion battery or 3 AAAs. The button on the end lets you cycle through 5 different modes: high, medium, low, strobe, and SOS. This really is a nice feature to have, especially if you’re planning to take it with you on hikes or camping and may come into an emergency situation where you do need help. 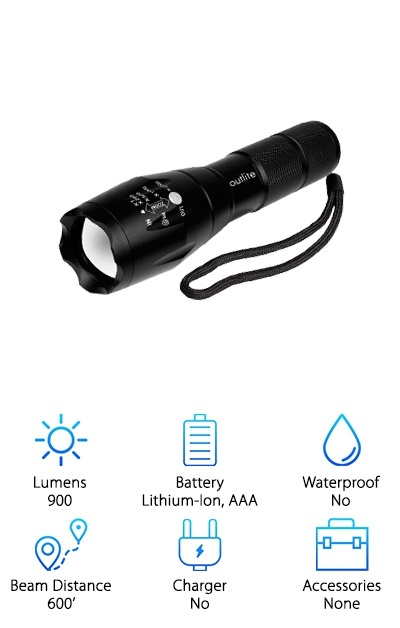 If you’re looking for a waterproof flashlight that’s compact and powerful, look no further. 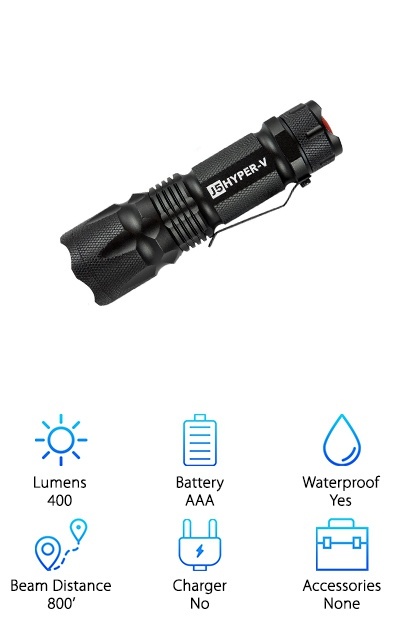 Because it’s waterproof, this is a good one to take with you if you’re camping, fishing, or boating because it can handle being accidentally (or purposely) submerged for short periods of time. Another reason that it’s great for outdoor adventures if because it has a strobe and SOS mode in case you get into any trouble. That’s not all, you get a high, medium, and low setting, too. 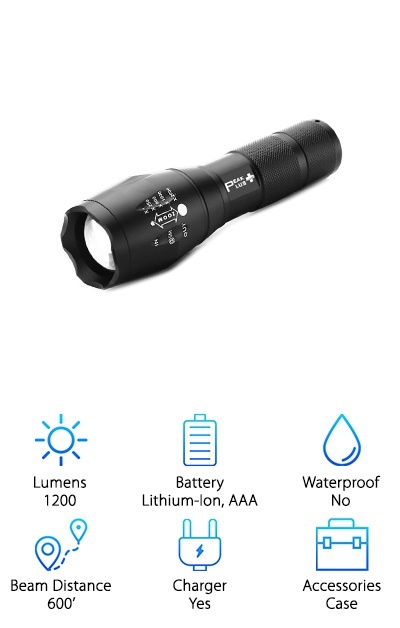 One really cool thing about this flashlight is how long a battery can last. It was designed with a high efficiency LED chip and has a really long lifespan. How long? Get this - 50,000 hours! One more thing, the front has a cool lotus shape that not only looks unique but also protects the lens. Uoline is one of the best tactical flashlight brands and once you get a look at this tactical flashlight, you’ll understand why. One thing that sets it apart is the aluminum alloy body. It’s durable and lightweight so you get a solid product without any added weight. It’s also 20% brighter than similar flashlights because it has a special reflector on the inside of the lens that projects the light with more intensity. In all, there are 5 different settings: full, medium, and a low power saver mode as well as a fast strobe and an SOS mode. This is a great one for a survival kit, camping, hiking, or even to keep in your car in case of emergency. It comes with some nice accessories, too: an aluminum carabiner and a sturdy black case. The YIFENG XML-T6 flashlight actually comes in a 2 pack, which is great. Keep one for yourself and give one as a gift. Who are we kidding? You’re going to want to keep them both so you can keep one with you at all times and one in your car. With this flashlight, you get an adjustable beam that can go from spotlight to floodlight quickly and easily. You can also cycle between high, middle, and low power plus a strobe and SOS setting just with the push of a button. It’s water resistant so you can feel comfortable taking it outside even when it’s raining. And get this. Because the frame is made of strong lightweight aluminum alloy, its front bevel is strong enough to break glass and a great tool for self-defense. This is a top pick for best rechargeable tactical flashlight. It’s so good, in fact, that it comes in a 2 pack. This has one of the longest possible beam distances we found at 1000 feet which is really quite impressive when you consider most of the other top models only give you about 600. 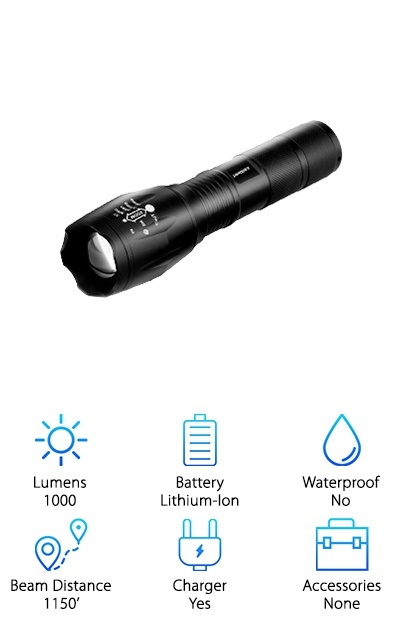 With 5 settings, including strobe and SOS mode, this flashlight is a great choice for daily use, night walks, camping, or hiking. Plus, you can tuck into your pocket or purse. If you’d rather wear it on your belt for easy access, good news! You get a holster for each flashlight, too. It even has an included lanyard so you can keep it secured to your wrist when you’re using it. One more thing: this one can survive a 10-foot drop. Another great choice for best led tactical flashlight it the URPower 18650. Our favorite thing about this one is that it comes with everything you need to get started using it right out the box. Well, you have to charge the battery first, which is fine because this one comes with both a battery and charger! You can actually save a bit of money with this one since you get an 18650 Lithium battery and a charger. The 1000 lumens can get a beam distance of 1150 feet, the longest in our reviews. 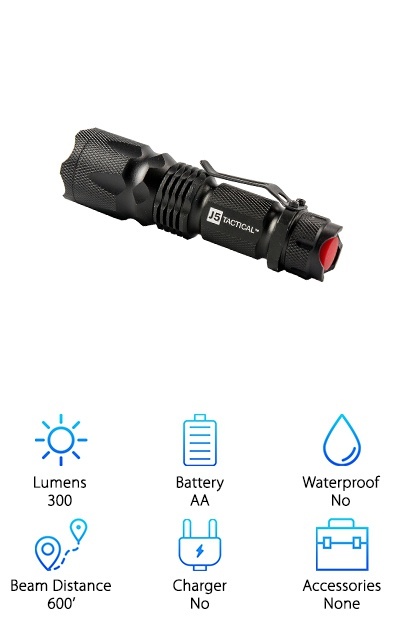 This is great for any kind of outdoor use because it’s equipped with strobe and SOS modes in addition to high, middle, and low settings and a spotlight and floodlight option. One more thing: this one is rainproof so it’s definitely safe to take outside in inclement weather. For a set of mini tactical flashlights that fit in the palm of your hand, you can’t beat the Hausbell Tactical Flashlight. At only 3.7 inches long, it’s a perfect size for your car’s glove compartment, to put in the nightstand next to your bed, or even carry around in your purse or backpack. Considering its size, it puts out an impressive amount of light with 300 lumens. There are also 3 different settings: bright, dim, and strobe. You can also adjust the beam for a more concentrated one or widen it to illuminate a larger area. And guess what else? You can use either a standard AA battery or a rechargeable 14500 lithium-ion one that can save you a bit of money. Believe us, this mini flashlight has to be seen to be believed. 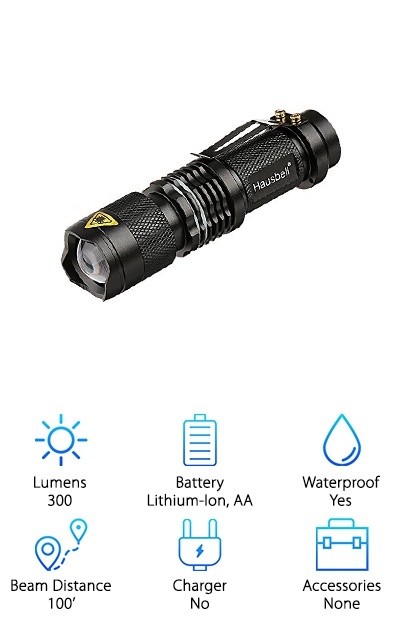 You can tell the J5 Hyper V Flashlight is tough just by looking at it. It’s handheld, compact, and built to be really tough. The aluminum alloy case is lightweight, too, and fits nicely into your pocket or bag and it’s a perfect size for the car. It’s also waterproof so it’s a great choice to take with you on camping or hiking adventures. This 400 lumen light shines a beam a whopping 800 feet, which is really impressive! In fact, this light has a reputation for being really bright. It has 3 light modes, too. High and low power and a strobe function that works great as an emergency beacon if you’re ever in trouble. And here’s the best thing about it. If you don’t absolutely love it, they’ll replace it or refund your money.